There’s commitment, and then there’s commitment. Then there’s madness. We’re still unsure about Jarod Kohler, the latest S2S member to take hold of the paddle: he spends two days in Foster doing unimaginable distances running, mountain biking and kayaking, err, and winning the Anaconda Adventure Race, flies back, packs his 4WD with kayaks and heads off to meet up with us. Arrival time 4:30am. Sleep time 2hrs. Back on the river by 8am. The man must like Landcare. 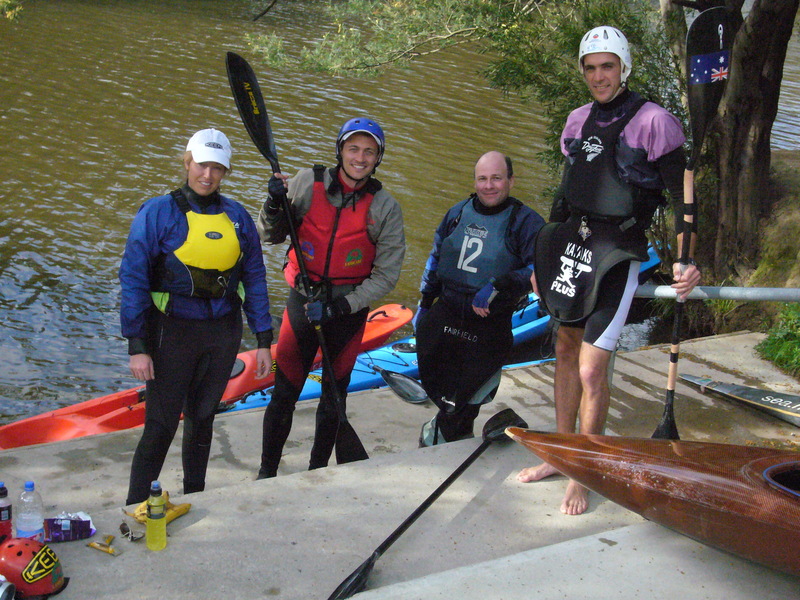 Also joining us on river was Paul Main, a canoe water polo player from the Fairfield Canoe Club with a penchant for paddling (rather skillfully) backwards down the river. So we set off, this time the river bank is awash with wattle; at times we’re paddling through a sea of yellow pollen. At least they’re native and holding the bank together. Another ubuiquitos element: water pumps. The landscape above the high bank is agricultural – a lot of wineries which need their water. Vegetation mass is varied, from bare and highly eroded banks with silted riverbends to patches with good native species mix in thick corridors and several landcare plantings, the seedlings still coddled in plastic protection. It’s here we catch sight of our wildlife highlights of the day: a platypus, an azure kingfisher and a yellow crested black cockatoo, all within cooee of each other. Other sightings weren’t so thrilling. An esky, an esky lid further downstream, 3 x tyres, countless pieces of household plastic containers, and 4 x yellow plastic ducks (the lost and abandoned from a duck race raffle fundraiser I suspect). One of the ducks has become our mascot, named Jono in honour of our fallen team mate – off to the physio today to check on that dislocated shoulder. In contrast to the first two days’ paddle…sorry, walk and paddle…the route was mainly flat, the flow slow and the river windy. 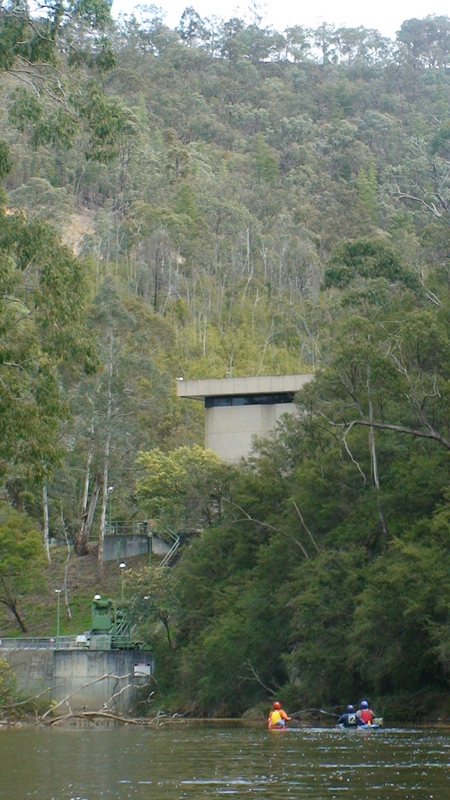 The section through Yering Gorge proved the most stunning, the high rock wall interrupted at one end by a pumping station that I’m told helps fulfil Melbourne’s thirst for water. Further on as the river slowed and just as the paddling began to get slightly monotonous (to the point one of us even tried to argue that the giant transmission lines were in their own way an interesting part of the landscape) we were joined by Warwick Draper, fresh back from competing in the K1 Slalom the Beijing Games. It was his first paddle since his last race where he registered a fifth placing. We finish the day at Warrandyte State Park, a rather attractive stretch (several stretches actually) of Parks Victoria managed bushland which was at the time of our arrival playing host to some drama. Well, soap actually, in the form of a TV crew filming Neighbours. With plenty of stunties wandering around the outdoors set in wetsuits and helmets (apparently for a boat crash scene), we looked the part for a paddle on role to say the least. Speaking of fashion – talking to Red Symonds on 774 ABC this morning, he mentioned that Landcare Week shares its dates this year with Fashion Week. As Red put it so nicely: “Rather appropriate given it’s fashionable these days to get involved in saving the environment. Let’s hope that’s one movement that never goes out of fashion eh?” We’ll be speaking to Red again tomorrow morning at 6.45am. Maybe he’ll be up for getting involved in saving the environment himself. Staring with a paddle for Landcare Week from Herring Island to Williamstown on Thursday? Red? What say you? We have the gear and the guides and there will be an Olympic paddler (Warwick) and a slightly over exuberant adventure racer (Jarod) on hand to guide you. 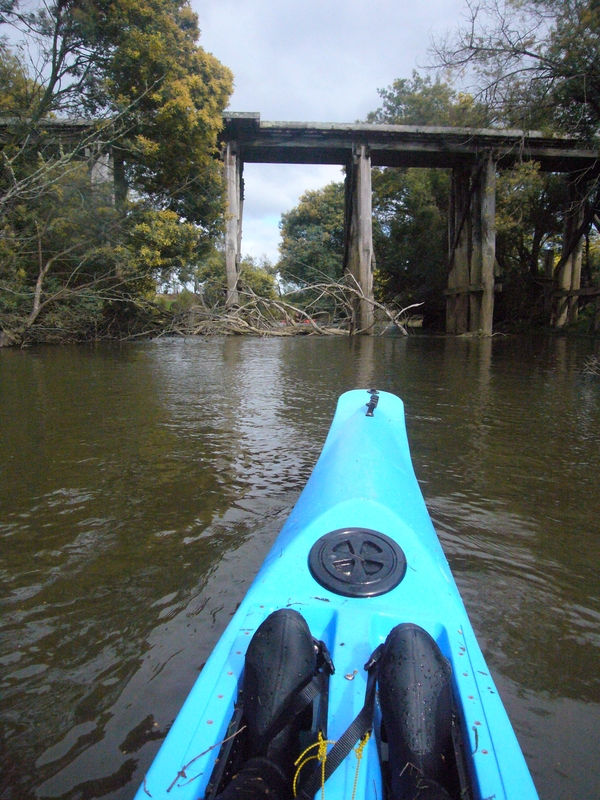 Tomorrow: we meet with a Warrandyte landcare group and once again paddle a long way with an eye to the riverbanks.